Pompeo Dismisses Saudi Prince's Link To Murder: We Have "No Direct Reporting" Connecting Him [VIDEO] - Joe.My.God. The secretary of state, Mike Pompeo, has said that downgrading US ties with Saudi Arabia over the killing of journalist Jamal Khashoggi would be a mistake for national security and would not push Saudis in a better direction at home. After repeated calls from members of Congress for a strong US response, Pompeo and the defense secretary, Jim Mattis, were briefing the US Senate behind closed doors about Saudi Arabia and the 2 October murder of Khashoggi at the Saudi consulate in Istanbul, as well as the civil war in Yemen. “The October murder of Saudi national Jamal Khashoggi in Turkey has heightened the Capitol Hill caterwauling and media pile-on. But degrading US-Saudi ties would be a grave mistake for the national security of the US and its allies,” Pompeo wrote in the Wall Street Journal. 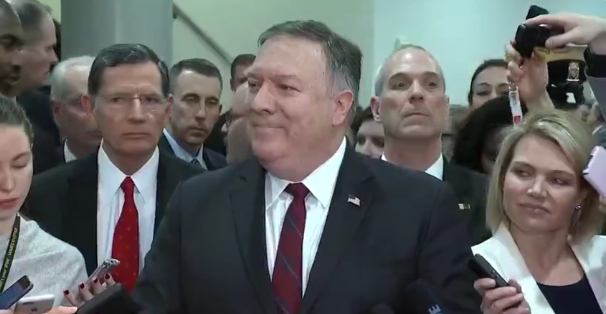 Pompeo claims there is “no direct reporting” that links Crown Prince MBS to Khashoggi’s killing as he dodges questions on why CIA Dir. Haspel wasn’t at Senate briefing. The CIA has reportedly concluded with “high confidence” MBS ordered Khashoggi’s killing. FLAKE is unmoved after the briefing, will still support Yemen resolution. Pompeo and Mattis argues against it.